Will I EVER Get to Go Fishing Again? I know that the fishing on Lake Fork is good right now. I am seeing reports from some of the folks over at Texas Fishing Forum and I know the fish are coming alive. The summer patterns are starting to work and the in-between post spawn blues are fading away until next year. Sooner or later I will be able to get out there and catch more bass, but I guess sometimes we have to be patient about these things and the right time will come sooner or later. A note to all of you out there who aspire to be self-employed. Sometimes it’s great, other times it will drive you crazy. I am in a period of the later. See ya on the lake soon! Upgrades for the Boat. 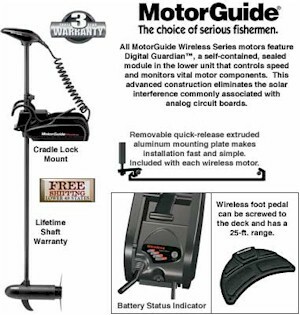 New MotorGuide W75 Trolling Motor. My boat is made and set up for fishing shallow inland salt water areas. That is what I was fishing when I bought it, so I had to make a few adjustments to optimize it for Bass fishing. The trolling motor was the biggest part of those changes. Fishing the areas where I used to fish in the saltwater required very little trolling motor use. Many boats in Florida and along the southern coastal areas do not even have a trolling motor. I got one when I bought the boat but it was a simple, hand-controlled MotorGuide Saltwater model. Today I had a MotorGuide W75 installed. It is totally digital and wireless. It comes with a wireless foot control that can work from anywhere in the boat. Since my boat has a center seat and a back seat I can fish from anywhere in the boat now. More importantly, I can either get the handheld remote control that is sold as an accessory or I can figure out a way to hang the foot switch from my belt and operate the trolling motor with my hand. No reaching, no kicking or shuffling my feet around when I am fishing. I can sit anywhere and operate the trolling motor comfortably and easily. It is smaller and easier to manage up and down as well. At 75 lb thrust, it should shove my boat around easily. It has an incremental speed setting so I can creep or I can make it fly with all the power the 24 volt system can muster. My old trolling motor was 12 volts. This one will be a big and welcomed change from the old one. MotorGuide offers a lifetime warranty on the shaft. That’s a huge claim for a trolling motor on Lake Fork. Below is a photo of it that is linked to the product at Cabela’s web site. Check it out. They are currently offering Free Shipping on this unit to those in the lower 48 states. Many thanks to Greg at Lakeside Trolling Motor in Yantis, TX. for setting it all up for me. The area below the deck on my boat is difficult to access. If you are in the area and need a trolling motor installed or if you want to buy my old one along with a 12 volt onboard charger for $225, call Greg at 903-383-7885. I’ll have more review information on it after using this baby for a while. Get local coupons for Mineola merchants at MineolaBuzz.com. Time for a new boat. The Lake is High. Water Water Everywhere. A Weekend at Lake Fork. A Few Nice Fish. A Nasty Storm. Quick Trip to Fish Topwater. Four Nice Bass. Time to Start Working the Post-Spawn Pattern? Is This the Last Cool Snap? Do Bigger Lures Catch Bigger Fish? Trailer Chains? Who Needs ‘Em! D & K on Upgrades for the Boat. New MotorGuide W75 Trolling Motor. Scott on Time for a new boat.